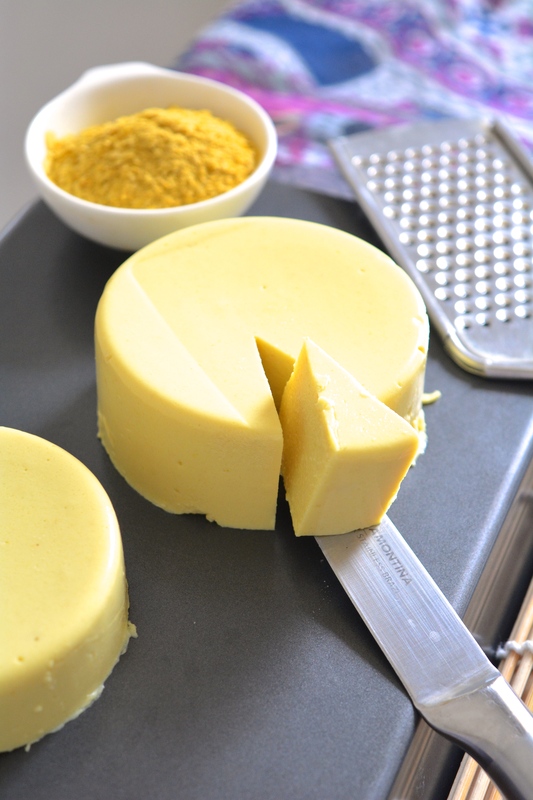 If you’re vegan and you’re craving cheese, you gotta try this. Super simple, can be whisked under an hour. Set to perfection, you can slice this, grate it, melt this, there is no oil in this and made from all natural ingredients. 7 ingredients (without counting water in) Best part of all, completely soy-free. How beautiful does this look? I asked Sanju to look at and he went, ‘What? You made it? It looks perfect’. I asked him to taste test it with real cheese. He tried both said this was the closest I have got to real cheese. Yayyyy!!! Discard the water from cashews. Rinse them really well. Add cashews to a food processor with nutritional yeast, garlic, starch, salt, lemon juice & 1/2 cup of water. Make a very very smooth paste. 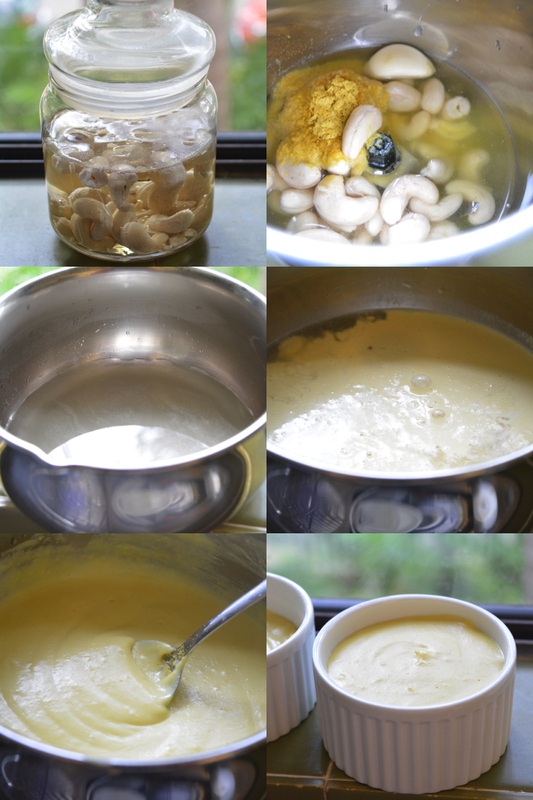 Add the cashew paste to agar agar mixture. 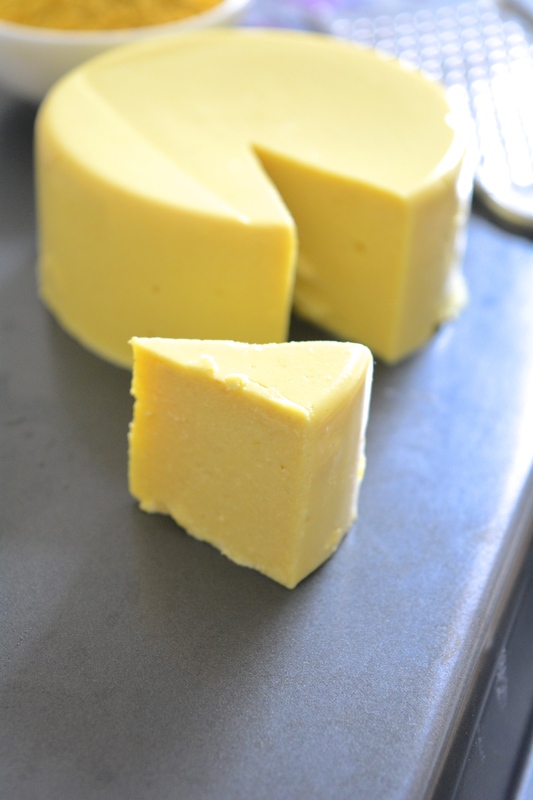 Bring this to boil on a low-medium heat until it forms a thick pancake-batter consistency. Quickly transfer to ramekins. This quantity makes one full ramekin and another 1/2 ramekin sized cheeses. You could add a pinch of turmeric for a deep yellow colour. Taste check the cashew paste. If you like it to be more tangy, feel free to increase the quantity of lemon juice. It will be a think ‘jelly’ consistency. Not as firm as normal cheese. However, you could hold and grate through a grater. Mine became a bit mushy. However, managed to pass through the sieve though. Guess what I did with this awesome cheese. 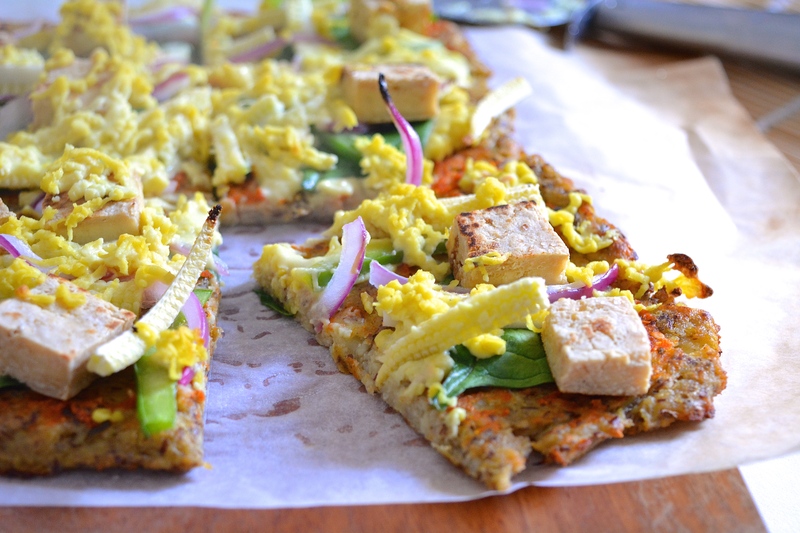 Made this Vegan, GF cauliflower crust with tofu and babycorn. Discard the water from cashews. Rinse them really well. Add cashews to a food processor with nutritional yeast, garlic, starch, salt, lemon juice & ½ cup of water. 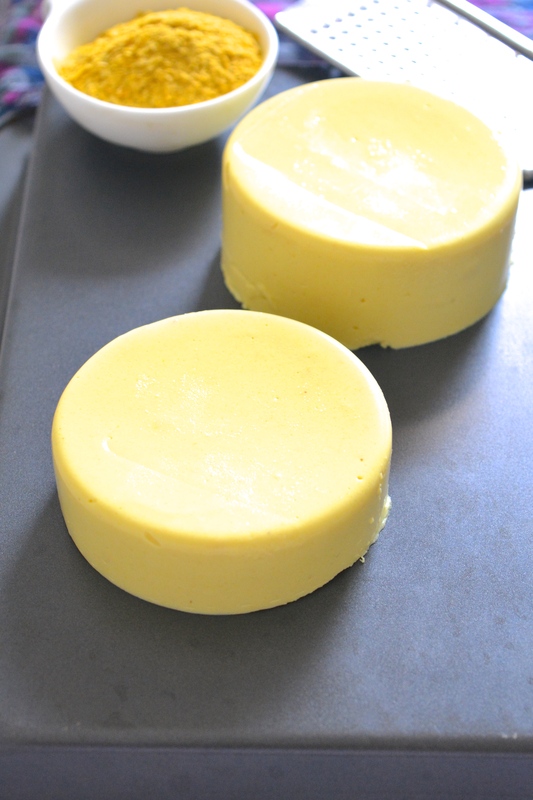 Make a very very smooth paste. Quickly transfer to ramekins. This quantity makes one full ramekin and another ½ ramekin sized cheeses. It will be a think 'jelly' consistency. Not as firm as normal cheese. However, you could hold and grate through a grater. Mine became mushy. Managed to pass through the sieve though. This looks really great – can’t wait to try! Yoou may yet make a vegan of me, Charanya! Vegan or not, this recipe is a keeper. thank you will try asap! OMG, this looks great, as usual a very simple recipe to follow. I MISS cheese, so I am definitely making this. You are just amazing. Thank you! Will let you know once I make it. This has e speechless, Charanya. I’ve not liked store bought vegan cheese much. Time to try another great recipe of yours! Innovative …. Looks amazing Charu…. Made it last night! Pictures helped and it came out great except I think mine is a bit softer as I don’t think I can grate it as you have done. I like it either way. I put it o n my rice crackers & had then first thing when I get back from work, a perfect snack! Thanks for giving such easy recipes to follow. Ok, good to know. It looked just like yours! :-)) Yes, it sorta breaks so I thought mine did not come out right. Do you have any idea how I feel when something I make comes out just like the pictures and tastes good? On top of the world! Wow! I am so totally going to make me some of this! Ahh! This is perfection, I NEED to make this. I am in England right now and can’t find nutritional yeast! Help! This is GENIUS!! The texture looks fantastic. I would like to prepared this recipe for a my family. One thing though, two of my aunts cannot eat anything prepared with citrus because it is too acidic for them. Would it be OK to use apple cider vinegar instead of the lemon juice? Thank you. I have never tried with vinegar. I am a bit skeptical about cashews and vinegar being heated at the same time. It could split. Why don’t you try adding vinegar at the very end. You could turn the heat off, then add in the vinegar, give a couple of good stir and transfer to ramekin. I think taste wise, vinegar would be a great addition. To cut through the acidity, add a 1/8 tsp of maple syrup as well. Virginia, did you ever make the cheese with acv? How did it turn out? I made it yesterday let overnitgh on the fridge and it still has just a soft cream consistensy, it never firmed at all. Am sorry, not sure why, Miraya. The brand of agar agar may be. Next time, double the agar agar quantity and check if that works. It is definitely not super-hard like real cheese, but you could slice them up for sure. 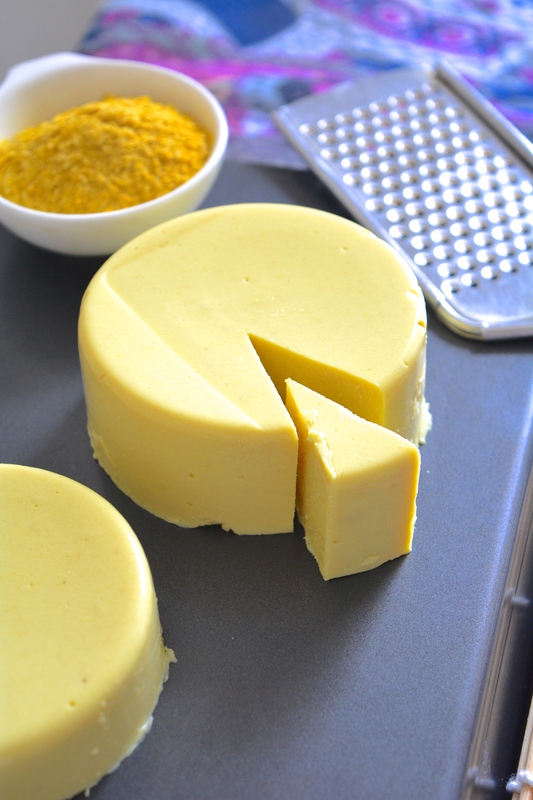 Wow this cheese looks yummy and so easy to make! I may just have to give it a try! You could actually re-heat the mixture and stir until it becomes glossy and a dense ‘pancake’ batter consistency. Try to set it after that. I am cooking for someone with lots of allergies. Yeast is a big one. Do you think this recipe would work if I omit the Nutritional Yeast or could you suggest a good substitute? Thank You. This cheese looks amazing! I tried it last night. The recipe is great. However, I don’t find the taste or texture resembles that of real cheese. 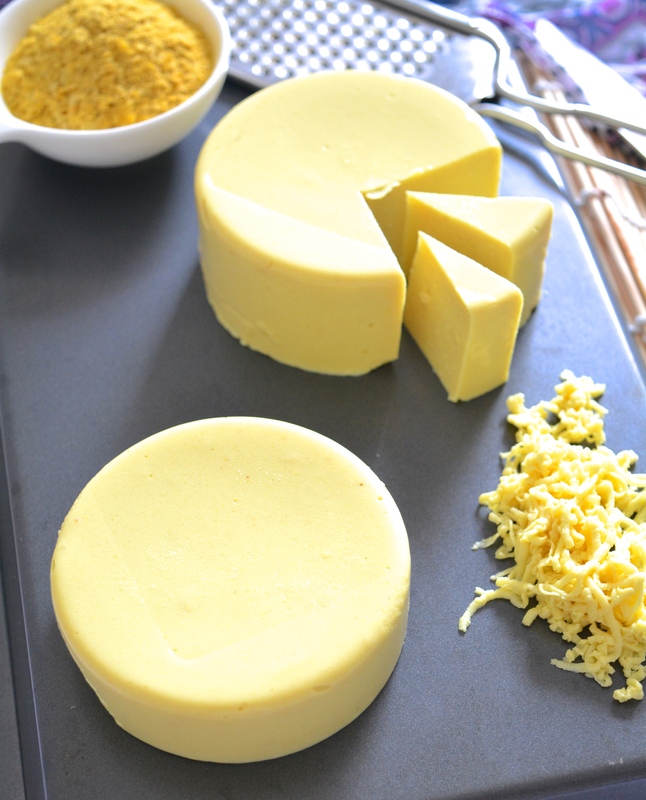 :;( I’m really looking for a cheese alternative as I have an intolerance to cheese but love the taste and texture. 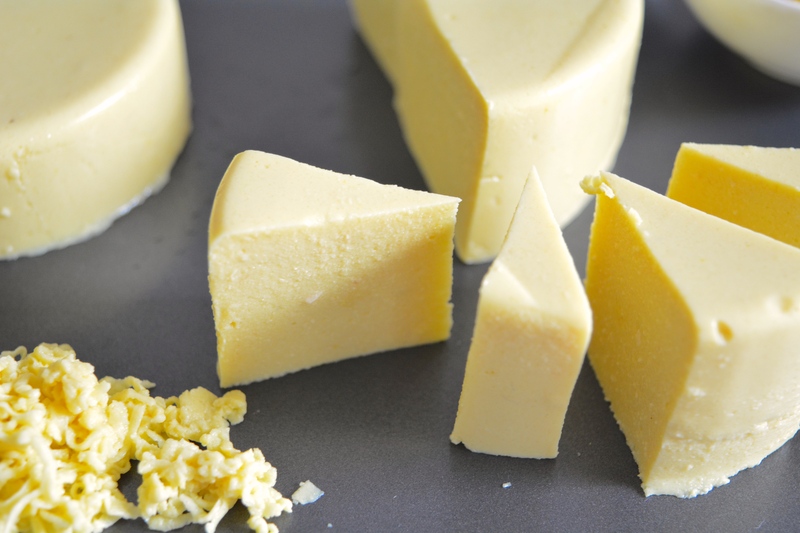 Would you have any suggestions for a firmer texture or cheesier taste? Thanks! I had to add a lot of nutritional yeast to achieve that cheesy flavour. 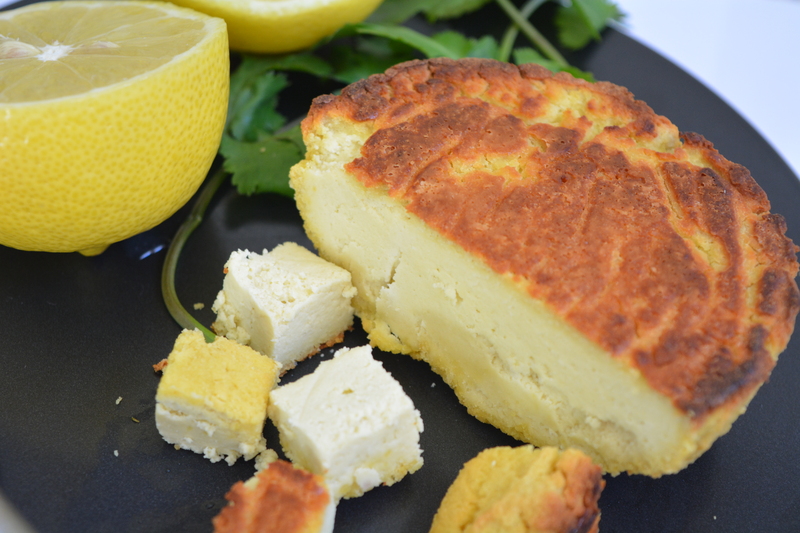 But at the end: the taste is amazing and this recipe opened me enterily new world of vegan cheeses. Before this I used to buy them, thinking they’re too tricky to make. 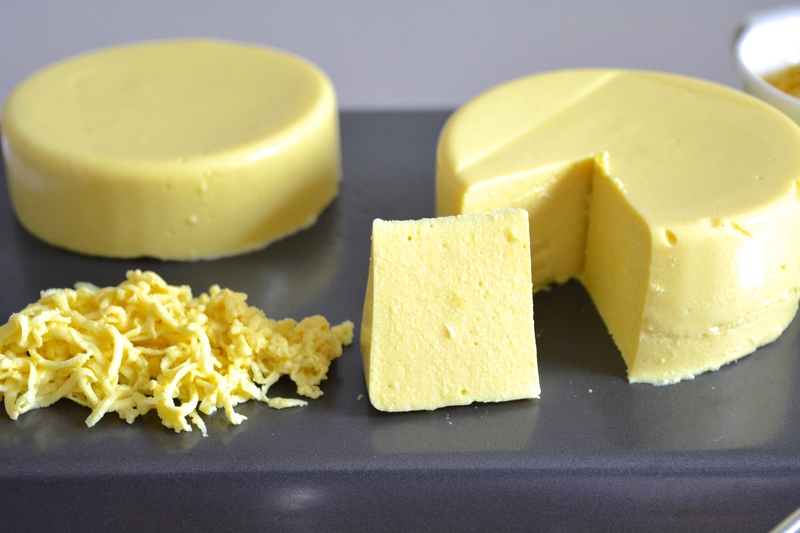 But after this recipe I’m definitely going to make my own vegan cheeses! Can I substitute the agar agar??? Sorry for getting back late Cindy. When you blend the cashews, add a Tbsp and half of cornstarch and throw the mixture back on pan and stir until it lumps as a ball. Chuck the mixture into a ramekin and chill it for an hour. I have tried this but the problem is, it could have a cornstarch taste to it. 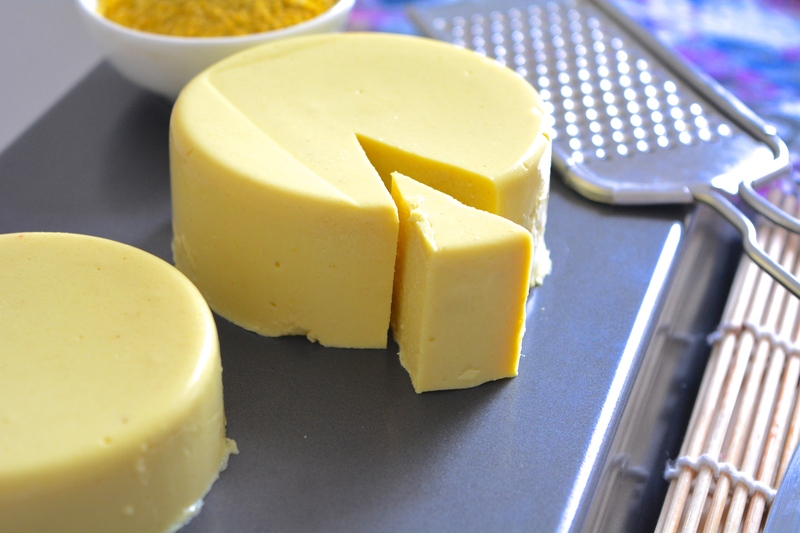 I want to make this cheese for my boyfriend because every store vegan brand we have tried so far tastes nasty! However, he is deathly allergic to all nuts. Is there anyway to substitute the cashews for something else? The easiest would be this, but it is more of a thick cheese spread, than solid cheese. In a pan, add a tsp of oil, add some garlic (2 pods), 1/4 of cubed red onion, wait until they are caramelized, add 1/2 head of cauliflower (chopped into small chunks), a pinch of turmeric, 1/2 cup water, 1/2 tsp salt, cover and let cauliflower cook for 15 mins on low heat until they are soft and mushy. the water should be gone now, but if is watery, let it sit on a open pan until water is almost gone. In a spice mill/a smoothie maker, add the contents of the pan, some chili flakes (if your boyfriend loves some heat), nutritional yeast (1.5 Tbsp), 1/4 cup water and 1 heaped tsp cornstarch. Add the cheese sauce back to pan and stir until it sort of lumps and is in a spread consistency.